Do all of your tales have tails? Mine too! Uplifting, heartfelt & positive tail wagging tales premier weekly hosted by Monique of Silver Paw Studio. As a lifelong animal lover like you and as a professional pet and people photographer you can imagine I have many tales to tell! Every week I will be premiering an episode that I narrate or a special guest will join me to share their tale. This podcasts goes along with the Tales with Tails facebook group at Silver Paw Studio so be sure to join me there too. Can You Love a Dog Too Much? Wayne and Beth recount the story of one of their clients. From Foe to Friend we answer the question "Can You Love a Dog Too Much?" If you learn to see the world from a dog's perspective it will all become clear. Be sure to check out Canine Companion Consulting. They train dogs, one human at a time, using positive, research-based methods. Spoiler Alert-they are my trainer with Bailey! https://www.caninecompanionconsulting.com/ https://www.facebook.com/CanineCompanionConsulting/ - search for their Separation Anxiety Support Group on their Facebook page too. Want to see photos of the cuteness discussed on the podcast? Join us in the Tales with Tails facebook group to share your furbabies. Podcasts episodes are featured on the Silver Paw Studio Blog too. Share your tale with the world too! Email Monique to schedule your interview. Monique@SilverPawStudio.com. We gallop into Season 3 with our first horse tale! Kim Wende tells the story of PJ. Over the years she and PJ have formed a bond through positive reinforcement training. While PJ may still have a few insecurities he trusts Kim and she knows how to sooth and communicate with him. Kim is a horse trainer in Texas at her company Passionate Horsemanship. She developed a system that incorporates positive reinforcement training with the Passionate Horsemanship holistic methods plus much more. Enjoy her free guide "7 Things That Cause Behavior Issues In Horses" on her website. https://passionatehorsemanship.com/ She has also launched a podcast with many helpful horse tips at https://anchor.fm/kimwende. Want to see photos of the cuteness discussed on the podcast? Join us in the Tales with Tails facebook group to share your furbabies. Podcasts episodes are featured on the Silver Paw Studio Blog too. Share your tale with the world too! Email Monique to schedule your interview. Monique@SilverPawStudio.com. Season two of Tales with Tails is a wrap. Your Tales filled this season with fun accounts of all kinds of pets spanning the years. Special announcement from the Silver Paw Studio fam...we adopted a dog! Be sure to follow along on Instagram, Facebook and the blog for my photo Barrages of Bailey! Now taking applications for Season 3. We would love to hear your heartfelt, silly and uplifting animal stories! Click http://bit.ly/taleswithtailsguest. Want to see photos of the cuteness discussed on the podcast? Join us in the Tales with Tails facebook group to share your furbabies. Podcasts episodes are featured on the Silver Paw Studio Blog too. My Fashionably Late Twin sister, Michelle, tells the tale of her cat Stoopid and his cat Einstein. We caught them in the aftermath of a giant party they hosted. (find Fashionably Late Twin on Instagram) Want to see photos of the cuteness discussed on the podcast? Join us in the Tales with Tails facebook group to share your furbabies. Podcasts episodes are featured on the Silver Paw Studio Blog too. Share your tale with the world too! Email Monique to schedule your interview. Monique@SilverPawStudio.com. Liana remembers Sadie her husband's Dalmatian and her determination to find food. Are you missing a breakfast from 2001? 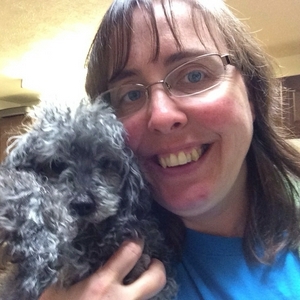 Liana founded Wet Noses Pet Sitting, a pet sitting and dog walking business in Northern Colorado. "Providing a new best friend for your pets and peace of mind for you." Want to see photos of the cuteness discussed on the podcast? Join us in the Tales with Tails facebook group to share your furbabies. Podcasts episodes are featured on the Silver Paw Studio Blog too. Share your tale with the world too! Email Monique to schedule your interview. Monique@SilverPawStudio.com. Diana recounts the tight spaces she used to find her exotic pet. Her non-slimy companion was a master at sending her on a hunt in the style of an Extreme Easter Egg Hunt. For more information on "herps" (including snakes) check out the website for the Northern Colorado Herpetological Society. https://nocohs.org/ Diana is the video editing genius behind my recent Cell Phone Photography for Pet Lovers course on Udemy! https://www.udemy.com/cell-phone-photography-for-pet-lovers If you or someone you know needs a video editor for their course Diana is the best! Reach her on her website at http://texastasker.com, learn her video editing tips on YouTube and connect with her at Diana Wilson on Linked In. Want to see photos of the cuteness discussed on the podcast? Join us in the Tales with Tails facebook group to share your furbabies. Podcasts episodes are featured on the Silver Paw Studio Blog too. Share your tale with the world too! Email Monique to schedule your interview. Monique@SilverPawStudio.com. Run through the park after a squirrel with Chan as a crashes a very important party. Cheryl recounts tales of her childhood Malamute, Chan. Creatives love to chase squirrels so I am sure Cheryl gleaned many of her Pearls of Wisdom in her early years with Chan. Cheryl is the Moxie Catalyst Coach who helped me birth the idea of Tales with Tails! (That tale is told in Episode 10). Join Cheryl in the Moxie Sisterhood here, check out her webpage here, or join the party on Facebook. Want to see photos of the cuteness discussed on the podcast? Join us in the Tales with Tails facebook group to share your furbabies. Podcasts episodes are featured on the Silver Paw Studio Blog too. Share your tale with the world too! Email Monique to schedule your interview. Monique@SilverPawStudio.com. Anthony shares the sweet tale of his very first cat as young adult, Miss Kitty. Many ups and downs and lessons learned about raising a young cat for the first time. Although a whirlwind beginning Miss Kitty lived many happy years with Anthony perhaps we will hear more of her adventures in a future episode. Want to see photos of the cuteness discussed on the podcast? Join us in the Tales with Tails facebook group to share your furbabies. Podcasts episodes are featured on the Silver Paw Studio Blog too. Share your tale with the world too! Email Monique to schedule your interview. Monique@SilverPawStudio.com. Jill carried Tony into the CSU destress event for HABIC this winter and immediately drew a crowd. Orange, calm and regal Tony the therapy kitty had arrived. With such an usual occupation I knew I had to interview Jill about the fabulous life of Tony. He's the most confident and laid back cat I've ever met and Jill says her only roll is to be his driver. Find out more about HABIC here and enjoy this tale. Want to see photos of the cuteness discussed on the podcast? Join us in the Tales with Tails facebook group to share your furbabies. Podcasts episodes are featured on the Silver Paw Studio Blog too. Share your tale with the world too! Email Monique to schedule your interview. Monique@SilverPawStudio.com. Therese Kopiwoda shares a hysterical childhood tale of an unusual family pet. Therese and I met on-line in her livestream group #PetLoversTribe a few years ago. While that group is now dissolved we all still stay in contact and are great friends (like Tricia in Episode 11). Through the Social Media Hound Therese teaches pet businesses livestreaming and more. Want to see photos of the cuteness discussed on the podcast? Join us in the Tales with Tails facebook group to share your furbabies. Podcasts episodes are featured on the Silver Paw Studio Blog too. Share your tale with the world too! Email Monique to schedule your interview. Monique@SilverPawStudio.com. Jess gushes about their very special chihuahua, Lupe, in this episode. Jess and Mat have fostered 46 pups over the years but Lupe is the only pup to join the fam permanently. Jess relates the tale of Lupe's journey to their home, how Lupe helps all the fosters and what Lupe means to them. Thank you so much Jess for telling us all your tales with tails. Want to see photos of the cuteness discussed on the podcast? Join us in the Tales with Tails facebook group to share your furbabies. Podcasts episodes are featured on the Silver Paw Studio Blog too. Share your tale with the world too! Email Monique to schedule your interview. Monique@SilverPawStudio.com. Season 2 kicks off with my first interview! Tricia Clement's shares her tale of baby Riedi being very cheesy. Tricia is a social media manager and consultant specializing in pet businesses and video at her company MuttButs.com. I will be posting the "double cheese Riedi" image in the Silver Paw Studio Instagram and blog. This season is all about YOUR tales with tails! To be considered as a guest just email me at Monique@SilverPawStudio.com Want to see photos of the cuteness discussed on the podcast? Join us in the Tales with Tails facebook group to share your furbabies. Podcasts episodes are featured on the Silver Paw Studio Blog too. Share your tale with the world too! Email Monique to schedule your interview. Monique@SilverPawStudio.com. Bundle up and head to your natural areas for a chance to see migrating bald eagles. Need a last minute gift? Something heartfelt, custom and Free? This bonus episode is just in time for Christmas highlighting giftofpodcast.com by Gretchen Rubin. How did I come up with the title of Tails with Tails? find out as I get vulnerable in this last episode of season 1. Season 2 will feature Your tales! Be sure to email to set a date to record. Want to see photos of the cuteness discussed on the podcast? Join us in the Tales with Tails facebook group to share your furbabies. Podcasts episodes are featured on the Silver Paw Studio Blog too. Share your tale with the world too! Email Monique to schedule your interview. Monique@SilverPawStudio.com. During an all day livestream event at Animal House Rescue and Grooming three adoption alums were interviewed. Mesa with Steve, Maggie & Murphy with Ann and Leo with Kathryn. Hear their stories on this episode and check out the videos on the Animal House Facebook page. Want to see photos of the cuteness discussed on the podcast? Join us in the Tales with Tails facebook group to share your furbabies. Podcasts episodes are featured on the Silver Paw Studio Blog too. Share your tale with the world too! Email Monique to schedule your interview. Monique@SilverPawStudio.com. A popular question I hear as a pet photographer is “What is the strangest animal you’ve ever photographed?” Find out the answer in this episode. Want to see photos of the cuteness discussed on the podcast? Join us in the Tales with Tails facebook group to share your furbabies. Podcasts episodes are featured on the Silver Paw Studio Blog too. Share your tale with the world too! Email Monique to schedule your interview. Monique@SilverPawStudio.com. “How do you not take them all home?” Volunteering at animal rescues and shelters as a photographer has its challenges. Find out how you can change the world for adoptable animals. During this season of giving I encourage you to #GiveWhereYourHeartLives. Want to see photos of the cuteness discussed on the podcast? Join us in the Tales with Tails facebook group to share your furbabies. Podcasts episodes are featured on the Silver Paw Studio Blog too. Share your tale with the world too! Email Monique to schedule your interview. Monique@SilverPawStudio.com. The lingo of the animal world can be a mystery. Can you decode all the words and phrases in this fictional story? Want to see photos of the cuteness discussed on the podcast? Join us in the Tales with Tails facebook group to share your furbabies. Podcasts episodes are featured on the Silver Paw Studio Blog too. Share your tale with the world too! Email Monique to schedule your interview. Monique@SilverPawStudio.com. Do you have a Life List? Are you a closet naturalist? You might be surprised! Want to see photos of the cuteness discussed on the podcast? Join us in the Tales with Tails facebook group to share your furbabies. Podcasts episodes are featured on the Silver Paw Studio Blog too. Share your tale with the world too! Email Monique to schedule your interview. Monique@SilverPawStudio.com. Episode 4: Seed, My Favorite! Finches adore a simple diet of seeds. Do you have a happy food dance? Want to see photos of the cuteness discussed on the podcast? Join us in the Tales with Tails facebook group to share your furbabies. Podcasts episodes are featured on the Silver Paw Studio Blog too. Share your tale with the world too! Email Monique to schedule your interview. Monique@SilverPawStudio.com. My fish want to dress up for Halloween! But how can I make that happen? Want to see photos of the cuteness discussed on the podcast? Join us in the Tales with Tails facebook group to share your furbabies. Podcasts episodes are featured on the Silver Paw Studio Blog too. Share your tale with the world too! Email Monique to schedule your interview. Monique@SilverPawStudio.com. The short tale of the day my golden retriever plummeted over a waterfall. Want to see photos of the cuteness discussed on the podcast? Join us in the Tales with Tails facebook group to share your furbabies. Podcasts episodes are featured on the Silver Paw Studio Blog too. Share your tale with the world too! Email Monique to schedule your interview. Monique@SilverPawStudio.com. The tale of Libby the poodle, my heart dog. 21 nicknames, 5 pounds, endless joy. Want to see photos of the cuteness discussed on the podcast? Join us in the Tales with Tails facebook group to share your furbabies. Podcasts episodes are featured on the Silver Paw Studio Blog too. Share your tale with the world too! Email Monique to schedule your interview. Monique@SilverPawStudio.com. We all enjoy a funny story, an uplifting account or a sweet childhood memory involving animals. Enjoy the weekly Tales and submit your own.